Centuries before biography became a business, before the peccadilloes of Royal mistresses and forgotten courtesans obtained a “market value,” the writing of the Master’s life by some cherished disciple was both an act of love and piety in the Far East. The very footprints of the famous dead became luminous, and their shadows shone in dark caves that once withheld them from the world. Memory looking back viewed them through a golden haze; they were merged at last in ancient sunlight; they were shafts of God rayed in the tangled forests of time. In this spirit, then, the man of compassionate feeling (such is the rendering of the Sanskrit Shama), the Shaman Hwui-li, took up his tablets and wrote the life of Hiuen-Tsiang. The Master had already written his immortal Si-yu-ki or Record of Western Countries, yet the sixteen years of that wonderful quest in far-off India, of cities seen and shrines visited, of strange people and stranger customs, cannot be crowded into one brief record. And so we watch the patient disciple waiting on those intervals of leisure when the task of translation from Sanskrit into Chinese is laid aside, when the long routine of a Buddhist day is ended, waiting for the impressions of a wandering soul in the birthland of its faith. The Life is supplement to the Record. What is obscure or half told in the one is made clear in the other. Hwui-li begins in the true Chinese manner with a grand pedigree of his hero, tracing his descent from the Emperor Hwang Ti, the mythical Heavenly Emperor. This zeal for following the remotest ancestors over the borders of history into the regions of fable may be largely ascribed to a very human desire to connect the stream of life with its divine source. We are chiefly concerned to know that he came from a family which had already given notable men to the State, and was launched “in the troublous whirl of birth and death” but a little distance from the town of Kou-Shih, in the province of Honan, in the year 600 A.D. Here and there biography leaves us a glimpse of his outward appearance as boy and man. We are told that “at his opening life he was rosy as the evening vapours and round as the rising moon. As a boy he was sweet as the odour of cinnamon or the vanilla tree.” A soberer style does justice to his prime, and again he comes before us, “a tall handsome man with beautiful eyes and a good complexion. He had a serious but benevolent expression and a sedate, rather stately manner.” The call of the West came early to Hiuen- Tsiang. From a child he had easily outstripped his fellows in the pursuit of knowledge, and with the passing of the years he stepped beyond the narrow limits of Chinese Buddhism and found the deserts of Turkestan between him and the land of his dreams. Imperfect translations from the Sanskrit, the limited intelligence of the Chinese priesthood, the sense of vast truths dimly perceived obscurely set forth, the leaven of his first Confucian training-all contributed to the making of a Buddhist pilgrim. 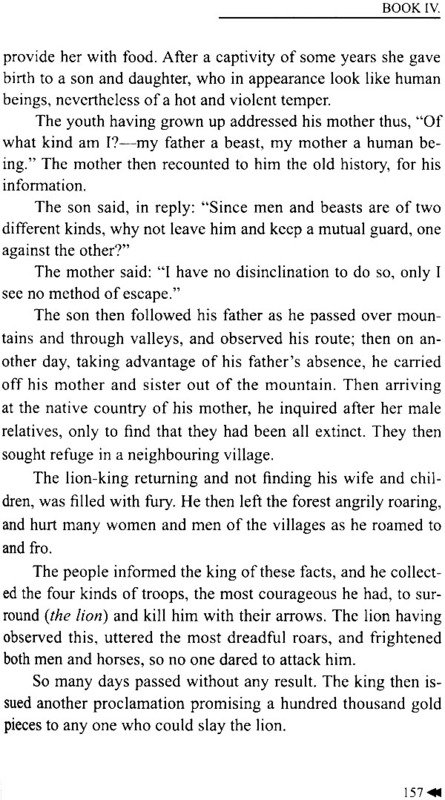 The period of his departure, 629 A.D., was an eventful one for China. T’ai-Tsung, the most powerful figure of the brilliant T’ang dynasty, sat on the throne of his father Kaotsu, the founder of the line. The nomad Tartars, so long the terror of former dynasties, succumbed to his military genius, and Kashgaria was made a province of the Empire. Already the kingdom of Tibet was tottering to its fall, and Corea was to know the Devastation of war within her boundaries. Ch’ang-an was now the capital, a city of floating pavilions and secluded gardens, destined to become the centre of a literary movement that would leave its mark for all time. But the days were not yet when the terraces of Teng-hiang-ting would see the butterflies alight on the flower-crowned locks of Yang-kuei-fei, or the green vistas re-echo to the voices of poet and emperor joined in praise of her. Only two wandering monks emerge furtively through the outer gates of the city’s triple, walls, and one of them looks back for a glimpse of Ch’ang-an, the last for sixteen eventful years of exile. Others had crossed the frontier before him, notably Fa-hian and Sung Yun, others in due course would come and go, leaving to posterity their impressions of a changing world, but this man stands alone, a prince of pilgrims, a very Bayard of Buddhist enthusiasm, fearless and without reproach. As we read on through the pages of Hwui-li, the fascination of the Master of the Law becomes clear to us, not suddenly, but with the long, arduous miles that mark the way to India and the journey home. Take the Master’s tattered robes, let the winds of Gobi whistle through your sleeve and cut you to the bone, mount his rusty red nag and set your face to the West. In the night you will see firelights as many as stars “raised by the demons and goblins; travelling at dawn you will behold” “soldiers clad in fur and felt and the appearance of camels and horsemen and the glittering of standards and lances; fresh forms and figures changing into a thousand shapes, sometimes at an immense distance, then close at hand, then vanished into the void.” The time comes when even the old red steed avails not, the Great Ice Mountains loom in front of you, and you crawl like an ant and cling like a fly to the roof of the world. Then on the topmost summit, still far away from the promised land, you realise two things-the littleness of human life, the greatness of one indomitable soul. But the superman is also very human. With the vast bulk of his encyclopedic knowledge he falls on the pretentious monk Mokshagupta, he flattens him and treads a stately if heavy measure on his prostrate body. And withal clear-sighted and intolerant of shams, he is still a child of his age and religion. With childish curiosity he tempts a bone to foretell the future, and with childish delight obtains the answer he most desires. In the town of Hiddha is Buddha’s skull bone, one foot long, two inches round. 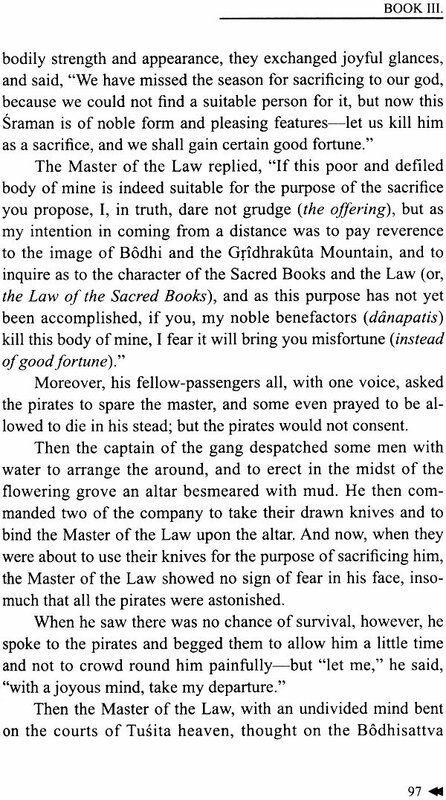 “If anyone wishes to know the indications of his guilt or his religious merit he mixes some powdered incense into a paste, which he spreads upon a piece of silken stuff, and then presses it on the top of the bone: according to the resulting indications the good fortune or ill fortune of the man is determined.” Hiuen obtains the impression of a Bodhi and is overjoyed, for, as the guardian Brahman of the bone explains, “it is a sure sign of your having a portion of true wisdom (Bodhi).” At another time he plays a kind of religious quoits by flinging garlands of flowers on the sacred image of Buddha, which, being caught on its hands and arms, shows that his desires will be fulfilled. In simple faith he tells Hwui-li how Buddha once cleaned his teeth and flung the fragments of the wood with which he performed the act on the ground; how they took root forthwith, and how a tree seventy feet high was the consequence. And Hiuen saw that tree, therefore the story must be true. But it is not with the pardonable superstitions of a human soul of long ago that we need concern ourselves. The immense latent reserve, the calm strength to persist, is the appeal. It comes to us with no note of triumph for the thing accomplished or the obstacle removed, but rather underlies some simple statement of fact and is summed up in these few trite words: “We advanced guided by observing the bones left on the way.” The little incidents of life and death are as nothing to one who looks on all men as ghosts haunted by reality. 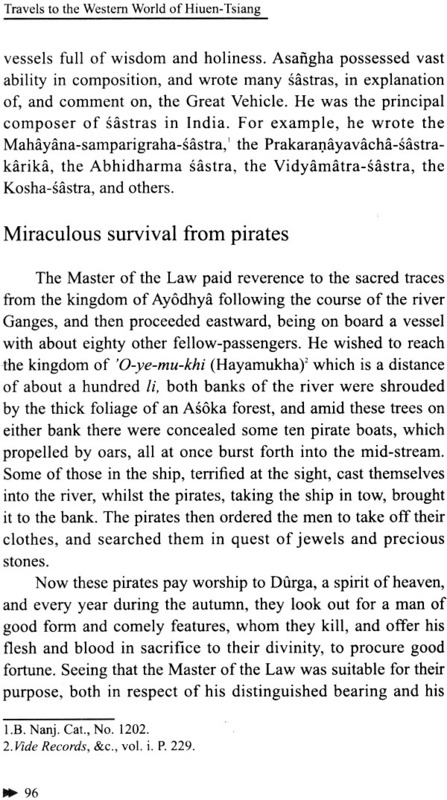 And so the Master of the Law resigns himself to the prospect of a violent end at the hands of the river pirates of the Ganges, to the miraculous interposition of a timely storm, with the same serenity with which he meets the long procession streaming out of Nalanda in his honour, with its two hundred priests and some thousand lay patrons who surround him to his entry, recounting his praises, and carrying standards, umbrellas, flowers, and perfumes. Yet there are moments of sheer delight when scenes of physical beauty are fair enough to draw even a Buddhist monk from his philosophic calm, when even Hiuen-Tsiang must have become lyrical in the presence of his recording disciple. Who would not be the guest of the abbot of Nalanda monastery with its six wings, each built by a king, all enclosed in the privacy of solid brick? “One gate opens into the great college, from which are separated eight other halls, standing in the middle (of the monastery). The richly adorned towers, and the fairy-like turrets, like pointed hilltops, are congregated together. The observatories seem to be lost in the mists (of the morning), and the upper rooms tower above the clouds. Here ten thousand priests sought refuge from the world of passing phenomena and the lure of the senses. But in pointing out the survivals of ancient faith so naively testified to by Hiuen- Tsiang, I have intended no disparagement to the gentle, compassionate Master of the Eastern World. Buddha could not have planted any tree that the jungles of India would not have swiftly strangled in one tropic night. He sought for Brahman- ism, that giant of the grove, the light and air for which it pined, he cleared the creepers that would have closed it in, he cut away the dead and dying branch and gave the tree of ancient faith its chance of attainment. And if be left the old wise Nagas to their woodland lakes, or paid silent recognition to the spirit of the Bodhi-tree, who shall blame him? Man the primitive, with his fresh mind brought to bear upon the mysteries around him, with all senses alert to catch the rhythmic pulses of life and view the silent growth that soared beyond him, with his imagination unfettered and his garb of convention as yet unsown, was nearer to the great dawn than all the book bound philosophers that followed him. 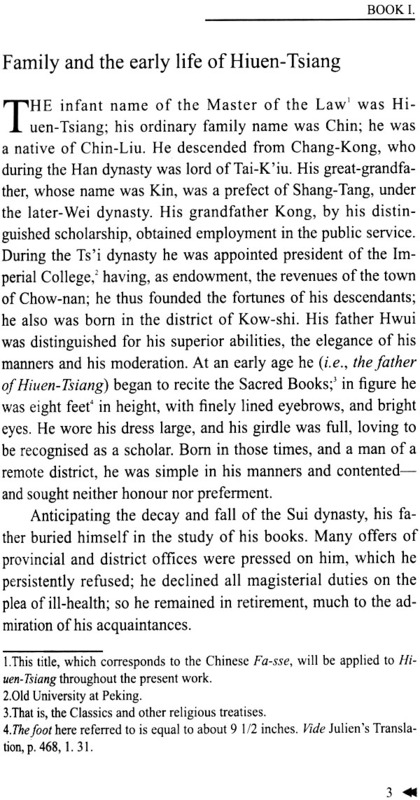 But Hiuen- Tsiang or Yuan Chwang, for such is the latest rendering of his name in the modern Pekinese, was born into a world that beheld the tree of Buddhism slowly dying from the top. He bore witness, if unconsciously, to a time of transition and a noble faith in decay, and the swift, silent growth of jungle mythology around the crumbling temples of Buddha. His record of these six- teen years of travel is a priceless one, for through it we are able to reconstruct the world and ways of Buddhist India of the centuries that have passed. Yet far more priceless still is that record, read between the lines, of a human soul dauntless in disaster, unmoved in the hour of triumph, counting the perils of the bone-strewn plain and the unconquered hills as nothing to the ideal that lay before him, the life-work, the call of the Holy Himalayas and the long toil of his closing years. It is difficult to over-estimate his services to Buddhist literature. 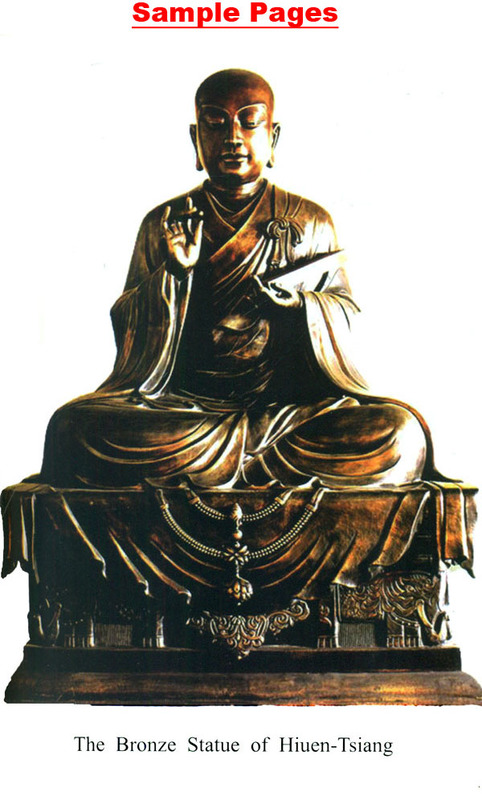 He returned to his own country with no less than 657 volumes of sacred books, seventy-four of which he translated into Chinese, while 150 relics of the Buddha, borne by twenty horses, formed the spoil reverently gathered from the many lands we call India. And so we leave him to his rest upon Mount Sumeru, where once his venturous soul alighted in the dreams of youth, with the serpents coiled beneath its base, with its seven circling hills of gold and the seven seas between, and the great salt ocean encompassing them all. There, as Mr. Watters has finely said, “he waits with Maitreya until in the fullness of time the latter comes into this world. With him Yuan-chuang hoped to come back to a new life here and to do again the Buddha’s work for the good of others.” Till then we leave him to the long interval of bliss transcending all planes of human ecstasy. The original from which the translation is made is styled “History of the Master of the Law of the three Pitakas of the ‘Great Loving-Kindness’ Temple.” It was written, probably in five chapters, in the first instance by Hwui-li, one of Hiuen- Tsiang’s disciples, and afterwards enlarged and completed in ten chapters by Yen-thsong, another of his followers. Yen-thsong was selected by the disciples of Hwui-li to re-arrange and correct the leaves which their master had written and bidden in a cave. He added an introduction and five supplementary chapters. The five chapters added by Yen-thsong are probably those which follow the account of Hiuen-Tsiang’s return from India, and relate to his work of translation in China. I have not thought it necessary to reproduce this part of the original; my object has been simply to complete the Records already, published relating to India. 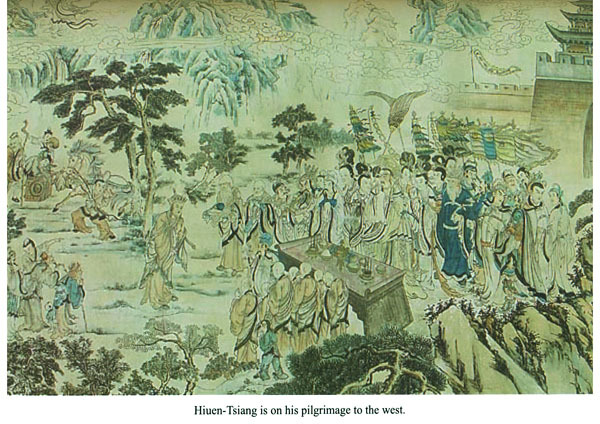 It will be found that Hwui-li’s history often explains or elucidates the travels of Hiuen-Tsiang. Yen-thsong evidently consulted other texts or authorities. This is especially the case in reference to the history of the Temple of Nalanda, in the third chapter of the book, compared with the ninth book of the Records. 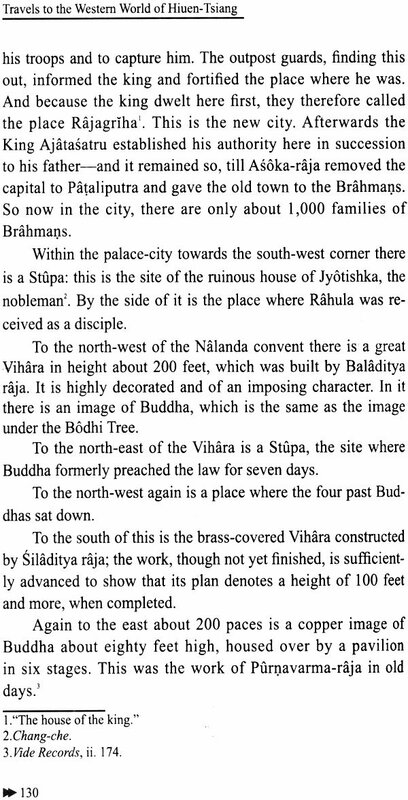 I may also notice the interesting statement found in the fourth book, referring to King Sadvaha (So-to po-ho), and the rock temple he excavated for Nagarjuna. Nagarjuna is now believed to have flourished as late as 100 years after Kanishka, i.e., towards the end of the second century A.D. This would also be the date of Sadvaha. Who this king was is not certain. He is said to have reigned over Shingtu, which may simply mean India. He was surnamed Shi-yen-to-kia (Sindhuka?). He probably had resided on the Indus, and by conquest had got possession of the Southern Kosala. Was he a Pallava? 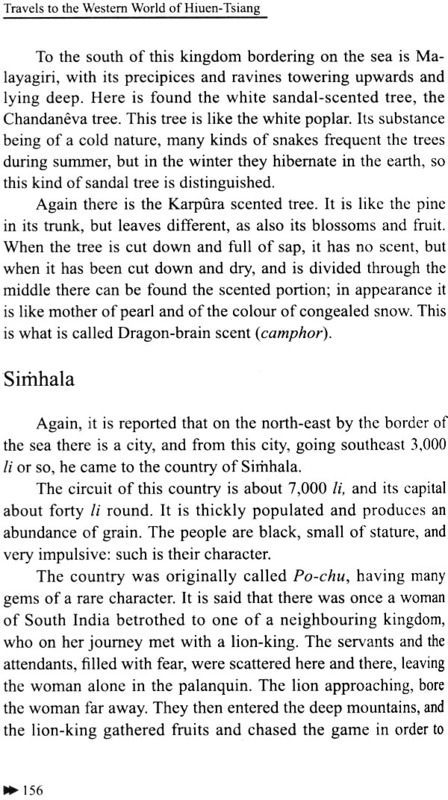 and was Alamana, where Nagarjuna knew him, the same as Aramana on the Coromandel Coast, between Chola and kalianga? Be that as it may, we know that Nagarjuna was so closely acquainted with the king that he sent him a friendly letter exhorting him to morality of life and religious conduct. The king in return prepared the cave-dwelling for him of which we have the history in the tenth book of the Records. This cave- dwelling was hewn in a mountain called Po-lo-mo-lo-ki-li, i.e., Bhramaragiri, the mountain of the Black bee (Durga). Dr. Burgess has identified this mountain with the celebrated Sri Sailas, bordering on the river Kistna, called by Schiefner Cri-Parvata. Doubtless it is the same as that described by Fahian in the 35th chapter of his travels. 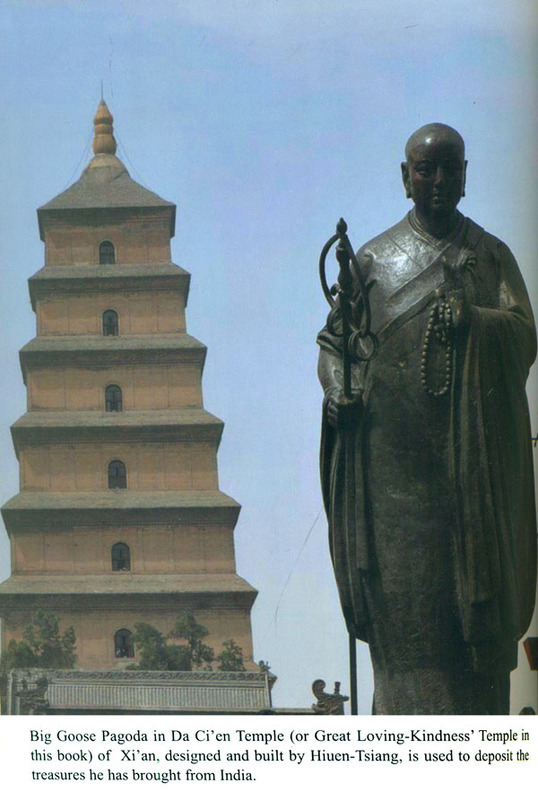 He calls it the Po-Io-yue Temple, which he explains as “the Pigeon” (Paravat) monastery. But a more probable restoration of the Chinese symbols would be the Parvati, or the Parvata monastery. The symbol yue in Chinese Buddhist translations is equivalent to va (or vat). We may therefore assume that the Po-Io-yue monastery of Fahian was the Durga monastery of Hiuen- Tsiang, otherwise called Sri-parvata. 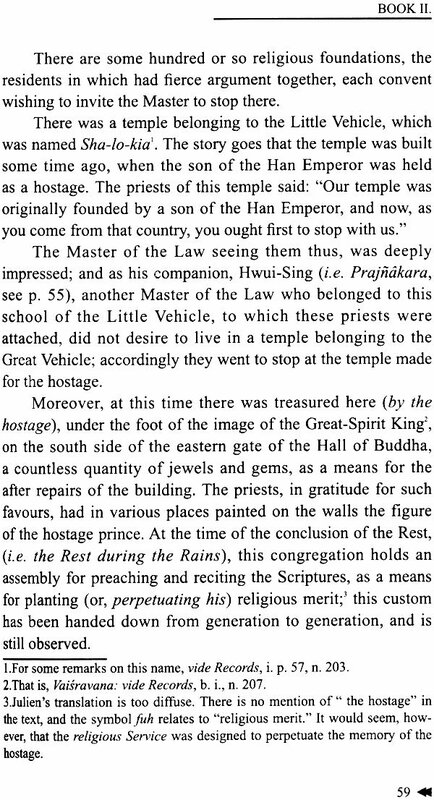 This supposition is continued by the actual history of the place; for Hiuen-Tsiang tells us that after the Buddhists had established themselves in the monastery, the Brahmans by a stratagem took possession of it. Doubtless, when in possession, they would give it a distinctive name acceptable to themselves; hence the terms Bhramara or Bhramaramba. With respect to Fa-hian’s restoration of Po-to-yue to Paravata, “a pigeon,” there need be no difficulty. It may have been called the “Pigeon monastery” in pre-Brahman times. The highest storey was probably decorated with pigeon-emblems,’ or, like the top beams of the gateways at Sanchi, adorned with the trisul emblem. This emblem, in all probability, originally denoted the three rays of the rising sun. These three rays, by the addition of a simple stroke at the base, were converted into a representation of a descending pigeon or dove. This would be sufficient to account for the name the Pigeon monastery. But there is no need to press this matter; for whether the symbol yue be equal to va or vat, in this particular case, there can be no doubt as to its true restoration. This remark leads me to allude briefly to the people named Yue-chi or Yue-ti in Chinese Buddhist literature. There is frequent mention made of the Vue-chi in Chinese books previous to the Turushka invasion of North-West India by the predecessors of Kanishka. The inhabitants of Vaisali are, e.g., in Buddha’s lifetime, called Yue-chi. 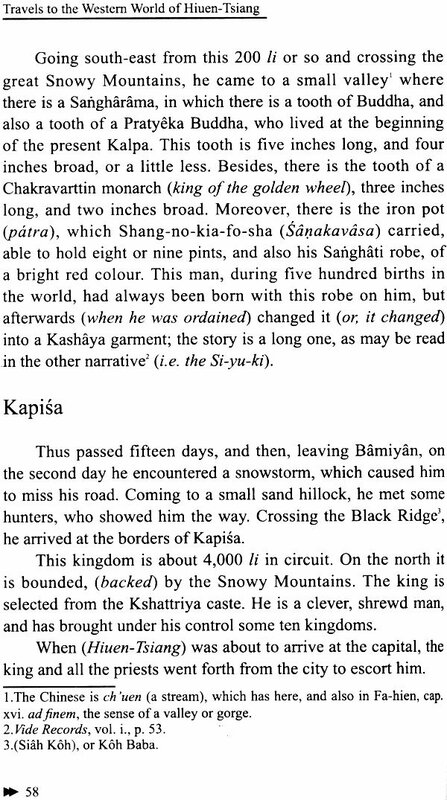 These people we know were Vajjis or vatis; they are represented as a proud and arrogant race, and remarkable for personal display and the equipment of their chariots. I should argue then that as the Amardi are called Mardi, and the Aparni are called Parni, so the Vatis were the same as the Avatis, But in the Scythic portion of the Behistun inscription we have distinct mention of the Afartis or Avartis as the people who inhabited the high lands bordering on Media and the south shores of the Caspian. Were the Vajjis or Vatis, then, a people allied to these Medes or Scyths, who at an early date had invaded India? The question at any rate is worth consideration.